A hybrid cloud is an integrated cloud service, which utilizes both, private and public clouds to perform distinctive functions within the same organization. The importance of hybrid cloud has increased on account of the versatility and dynamic nature of work. It offers numerous benefits such as cost efficiency and scalability, flexibility, and security. Owing to these benefits, organizations are shifting toward hybrid cloud to achieve security of data, application, and large storage spaces to reduce their capital expenditure by deploying a combination of the private and public cloud model. 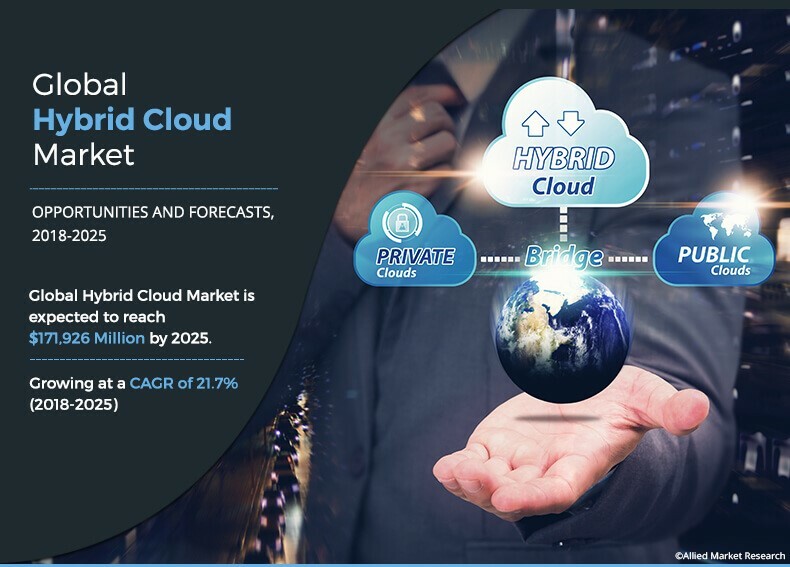 The global hybrid cloud market size was valued at $36,138 million in 2017, and is projected to reach $171,926 million by 2025, growing at a CAGR of 21.7% from 2018 to 2025. 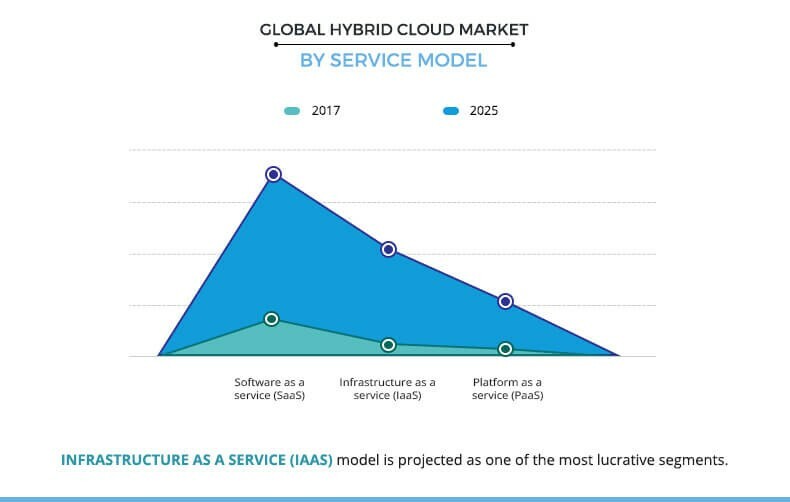 The software as a service (SaaS) segment dominated the overall hybrid cloud market in 2017 and is expected to continue this trend during the forecast period, due to growth in demand for SaaS as numerous users are seeking more purpose-built and customized solutions that can meet their specific business outcomes. 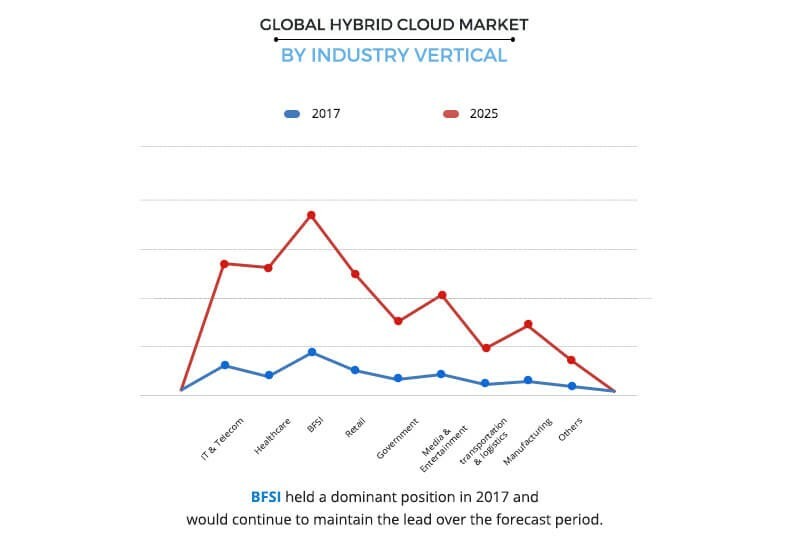 The BFSI segment dominated the overall hybrid cloud market in 2017 and is expected to continue this trend during the forecast period owing to increased adoption of hybrid cloud in the BFSI sector, as it helps banks manage costs with great flexibility and enables them to quickly provide resources across the entire enterprise. The North America region dominated the overall Hybrid cloud market share in 2017, owing to growth in demand for hybridization services in the U.S., However, Asia-Pacific is expected to witness the highest growth rate during the forecast period. The report focuses on the growth prospects and restraints of the market based on the analysis of the global hybrid cloud market trends. The study provides Porter’s five forces analysis of the hybrid cloud industry to understand the impact of various factors such as bargaining power of suppliers, competitive intensity of competitors, threat of new entrants, threat of substitutes, and bargaining power of buyers, on the growth of the hybrid cloud market. The global hybrid cloud market is segmented by component, service model, organization size, industry vertical, and region. Based on component, the market is segmented into solution and services. The solution segment is again bifurcated into hardware and software. 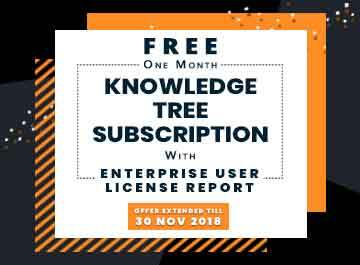 In terms of service model, the market is segmented into software as a service (SaaS), infrastructure as a service (IaaS), and platform as a service (PaaS). Based on organization size, the market is divided into large enterprises and small & medium enterprises. By industry vertical, the market is classified into IT & Telecom, healthcare, BFSI, retail, government, media & entertainment, transportation & logistics, manufacturing, and others. As per region, the hybrid cloud market is analyzed across North America, Europe, Asia-Pacific, and LAMEA. The key players operating in the global hybrid cloud market include Microsoft Corporation, Amazon Web Services, Inc., VMware, Inc., Rackspace Inc., Hewlett Packard Enterprise, Dell EMC, IBM Corporation (International Business Machines), Google LLC, Verizon Enterprise, Cisco Systems, Inc., and others. Hybrid cloud market analysis includes major factors impacting the growth. Shift in preference toward hybrid cloud, growth in digital disruptions, and increased adoption of hybrid cloud in IT service management (ITSM) models act as major drivers of the market. However, network complications & growth in security concerns are expected to hamper the hybrid cloud market growth during the forecast period. Furthermore, high adoption among small and medium organizations and emergence of hybrid IT services are expected to provide lucrative opportunities for the hybrid cloud market. Hybrid cloud platform has been gaining popularity as it not only offers flexibility, scalability, and multi-cloud space, but also provides security assurance to organizations. In addition, the step toward hybrid cloud makes the integrity of data and services a major priority for organizations. Therefore, it is significant to get the right combination of on-premise and numerous as-a-service offerings to confirm the constant availability of data that can be coordinated across multiple platforms. Furthermore, according to a survey, IT leaders spend 56% of the time on maintenance and operational issues and 24% spend on technological advancements. Moreover, they spend 20% of the time on working with business leadership on digital transformation initiatives, which is extremely time-consuming and cost-intensive; hence, inclining organizations toward hybrid cloud. Organizations are currently entering into the third wave of digital disruption supported by underlying forces such as long-term falling cost of computing, storage, and communications. Surviving in the digital transformation is the compelling new reality for industries across the world. Factors such as growth in need for connectivity, increase in reliance on mobile communications, convergent data, and others have accelerated the velocity of disruptions. For instance, over 90% of the organizations worldwide have voiced intentions to leverage digital disruptions for survival and as a business opportunity to cope up with the competitiveness in the industry. Hybrid IT services is an approach to enterprise computing in which an organization provides and manages information technology resources in-house but uses cloud-based services for others. This allows an enterprise to maintain a centralized approach to IT governance, while experimenting with cloud computing. Hybrid IT is transforming IT architectures and is a result of combination of internal and external services usually of internal and public clouds. Hybrid IT consists of services such as cloud consulting, implementation, migration, automation, containerization as a service, complete managed services, and others. The study provides an in-depth global Hybrid cloud market size along with current trends and future estimations to elucidate the imminent investment pockets. Current and future Hybrid cloud market trends are outlined to determine the overall attractiveness and to single out profitable trends to gain a stronger foothold in the global market. Quantitative analysis of the current market and forecast for the period of 2017-2025 is provided to highlight the financial appetency of the Hybrid cloud market forecast. Porters Five Forces analysis illustrates the potency of buyers and suppliers that participate in the Hybrid cloud industry. The hybrid cloud market is segmented based on components, service model, organization size, industry vertical, and geography. 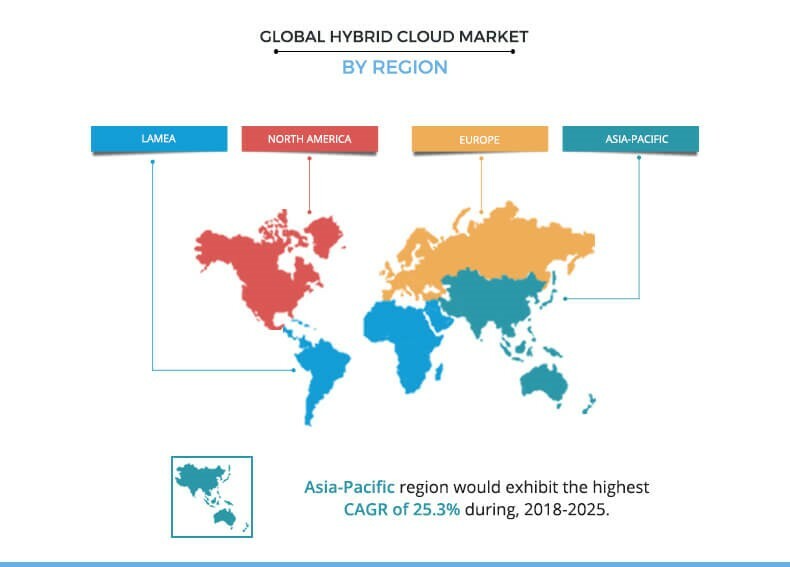 The global hybrid cloud market is driven by factors such as growth in adoption of cloud applications, development of hybrid integration platforms by mainstream organizations, rise in penetration of hybrid cloud in relatively untapped SMEs, mid-sized markets, and outside the U.S., especially India. Although major focus is on the public cloud and its associated companies in the global cloud market, private and hybrid cloud organizations are expected to exhibit promising growth in the coming years. Moreover, employees continue to bring their own devices into the enterprise environment due to the emergence of bring-your-own-device (BYOD) trend. Therefore, use of cloud services outside the company’s infrastructure is expected to provide numerous opportunities for the market. Organizations have realized that a single cloud strategy is no longer sufficient to cater to the various business needs, and hence, have shifted to hybrid cloud strategy. Although hybrid cloud solutions provide numerous benefits, the emergence of issues related to data security and compliance are expected to hinder the growth of the market. The organizations implementing hybrid cloud architectures face difficulties with cloud security management. The global hybrid cloud market is highly competitive owing to the strong position of the existing vendors. These companies have economies of scale and a huge geographical presence. Some of the major key players profiled in the report include Microsoft Corporation, Amazon Web Services, Inc., VMware, Inc., Rackspace Inc., Hewlett Packard Enterprise, Dell EMC, IBM Corporation (International Business Machines), Google LLC, Verizon Enterprise, Cisco Systems, Inc., and others. These players have adopted various strategies to enhance their product & service offerings and increase their market penetration. For instance, in June 2018, Cisco and NetApp announced new FlexPod solutions that combine Cisco UCS integrated Infrastructure with NetApp data services to help organizations accelerate application delivery and transition to a hybrid cloud with a trusted platform for innovation. Similarly, in June 2017, Dell EMC announced a new hybrid cloud platform called Cloud for Microsoft Azure Stack, which is expected to accelerate the implementation and sustenance of the hybrid cloud based on Microsoft Azure Stack. Moreover, the hybrid cloud market has attracted more players and hence, leads to high competition among existing and new players.